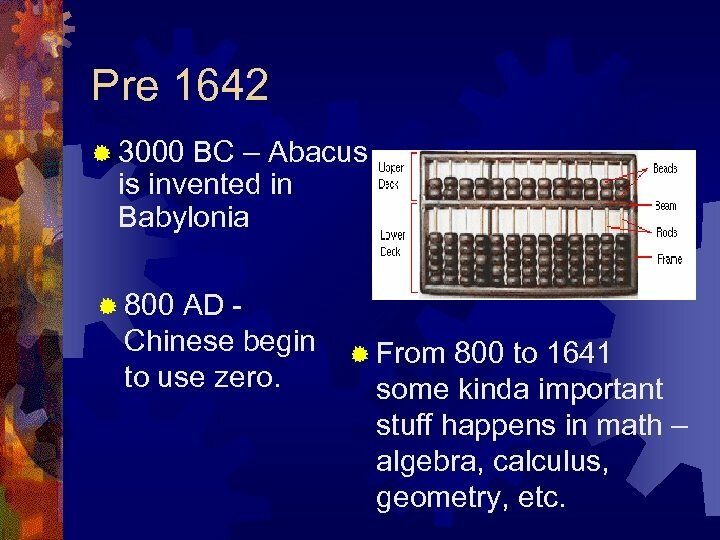 Pre 1642 ® 3000 BC – Abacus is invented in Babylonia ® 800 AD Chinese begin to use zero. ® From 800 to 1641 some kinda important stuff happens in math – algebra, calculus, geometry, etc. 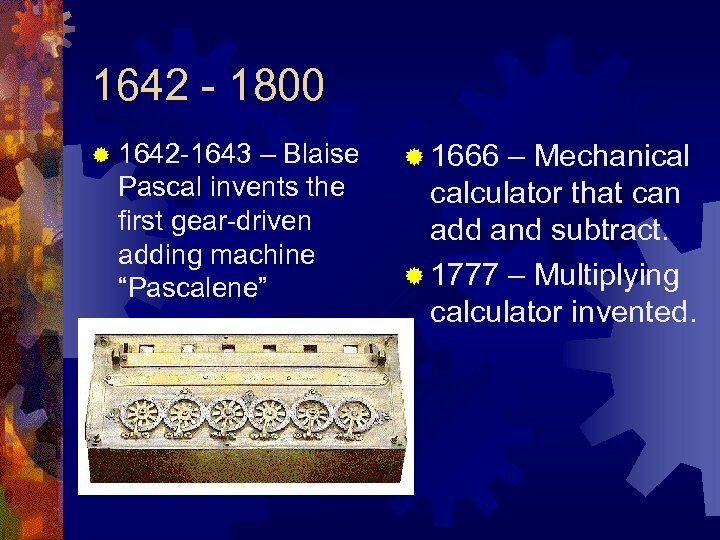 1642 - 1800 ® 1642 -1643 – Blaise Pascal invents the first gear-driven adding machine “Pascalene” ® 1666 – Mechanical calculator that can add and subtract. ® 1777 – Multiplying calculator invented. 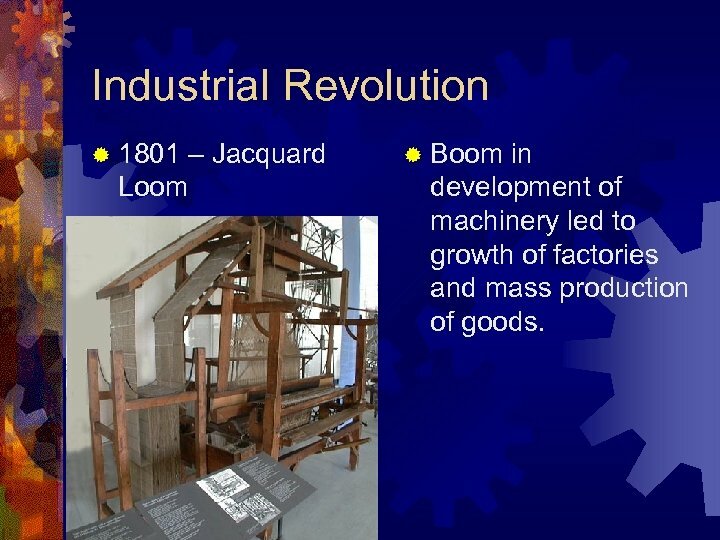 Industrial Revolution ® 1801 Loom – Jacquard ® Boom in development of machinery led to growth of factories and mass production of goods. 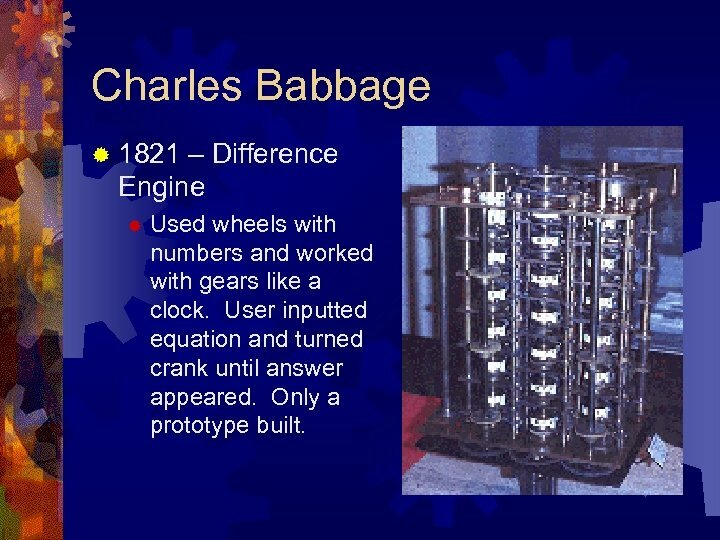 Charles Babbage ® 1821 – Difference Engine ® Used wheels with numbers and worked with gears like a clock. User inputted equation and turned crank until answer appeared. Only a prototype built. 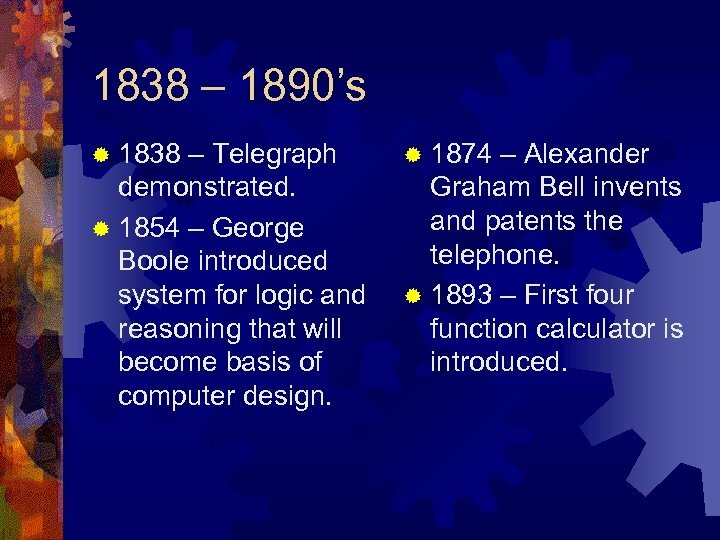 1838 – 1890’s ® 1838 – Telegraph demonstrated. 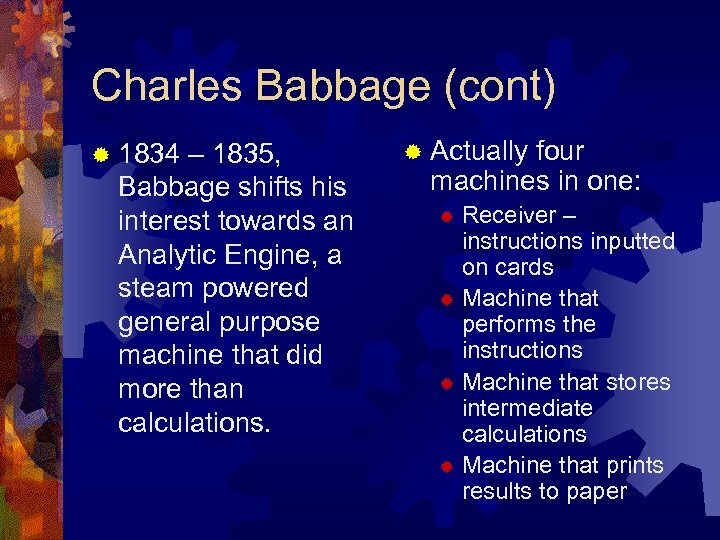 ® 1854 – George Boole introduced system for logic and reasoning that will become basis of computer design. ® 1874 – Alexander Graham Bell invents and patents the telephone. 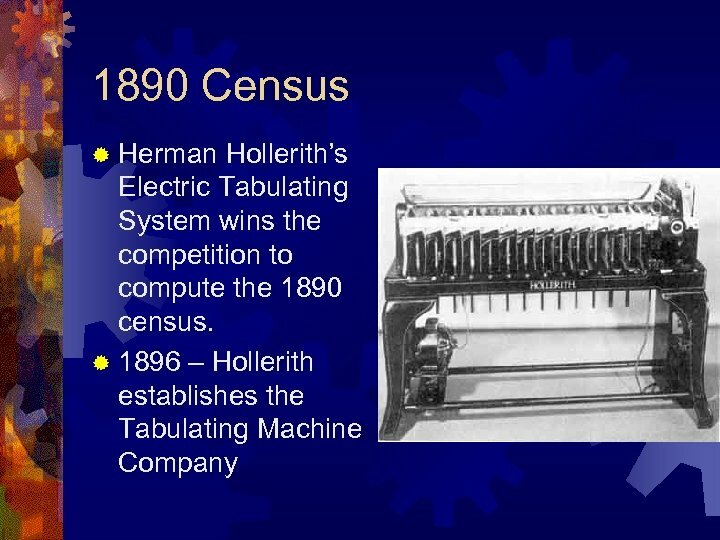 ® 1893 – First four function calculator is introduced. 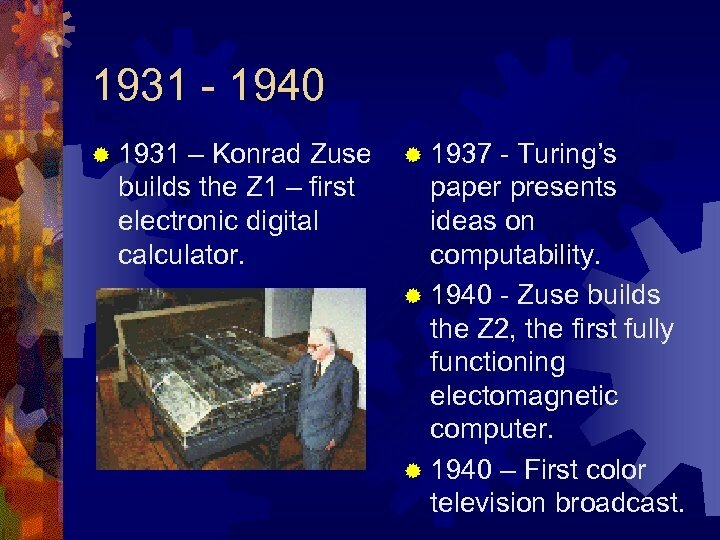 1931 - 1940 ® 1931 – Konrad Zuse builds the Z 1 – first electronic digital calculator. ® 1937 - Turing’s paper presents ideas on computability. 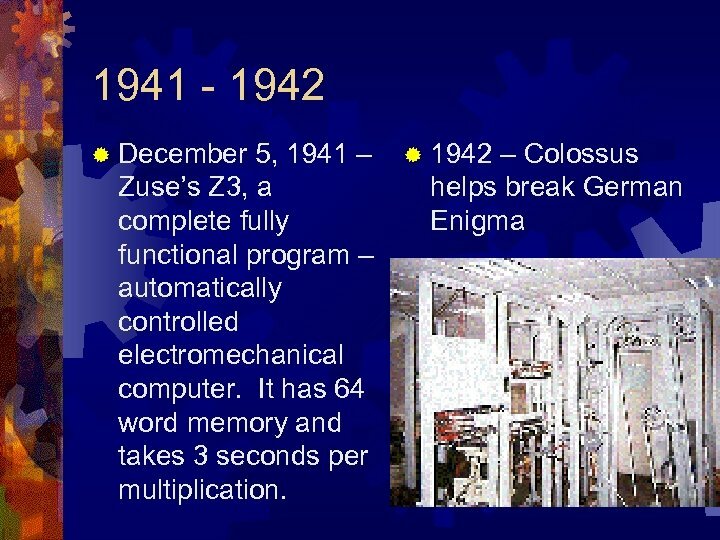 ® 1940 - Zuse builds the Z 2, the first fully functioning electomagnetic computer. 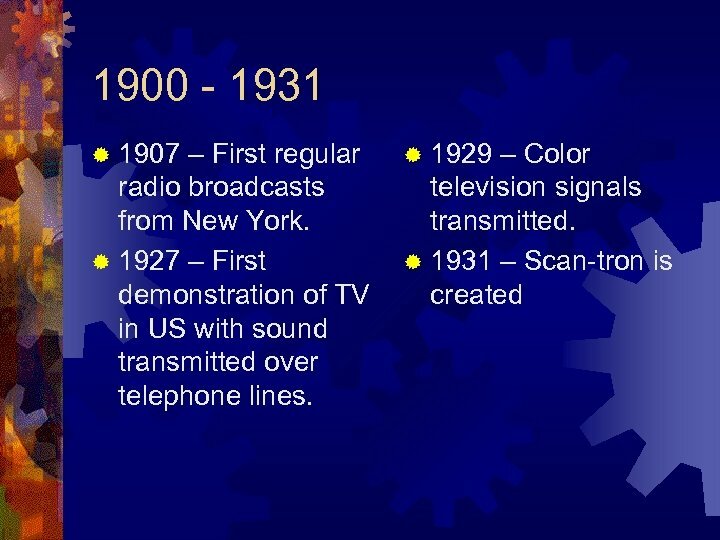 ® 1940 – First color television broadcast. 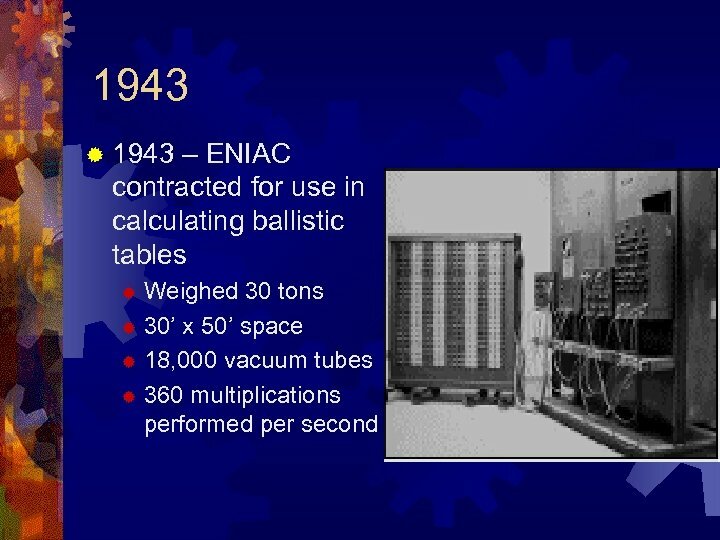 1945 - 1950 ® June 1945 – Stored program computer idea introduced by John von. Neumann. 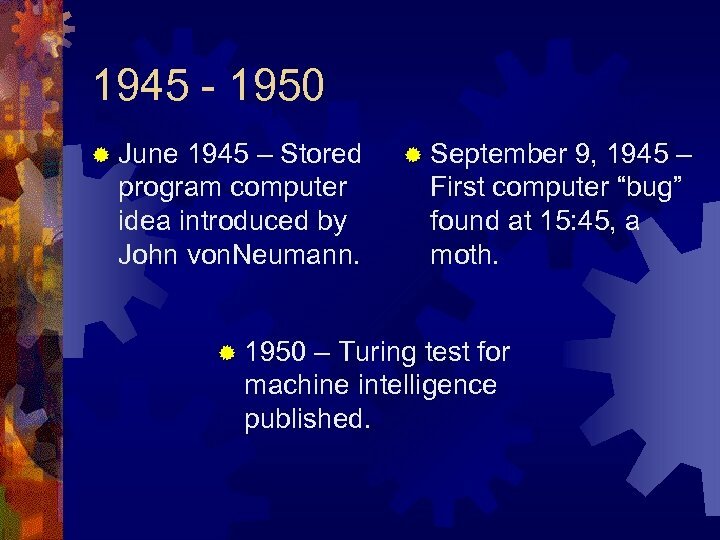 ® 1950 ® September 9, 1945 – First computer “bug” found at 15: 45, a moth. – Turing test for machine intelligence published. 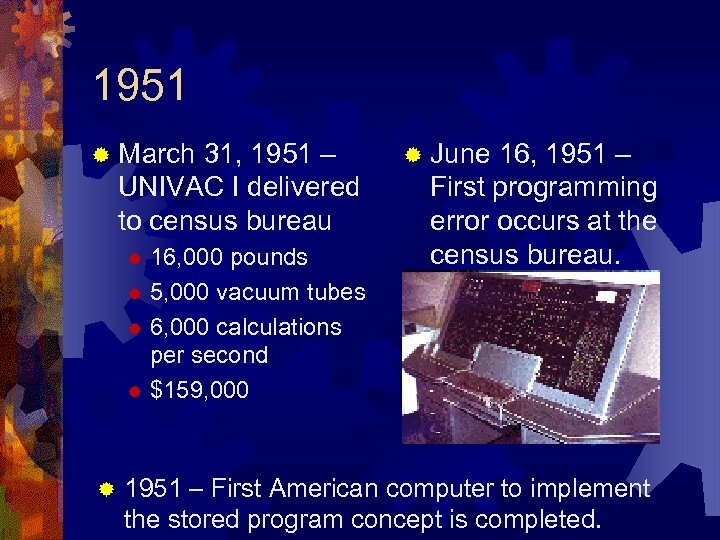 1951 ® March 31, 1951 – UNIVAC I delivered to census bureau 16, 000 pounds ® 5, 000 vacuum tubes ® 6, 000 calculations per second ® $159, 000 ® ® ® June 16, 1951 – First programming error occurs at the census bureau. 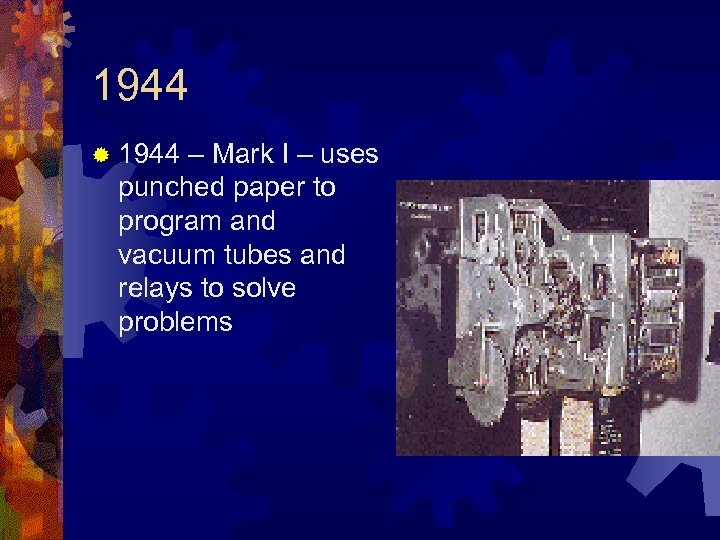 1951 – First American computer to implement the stored program concept is completed. 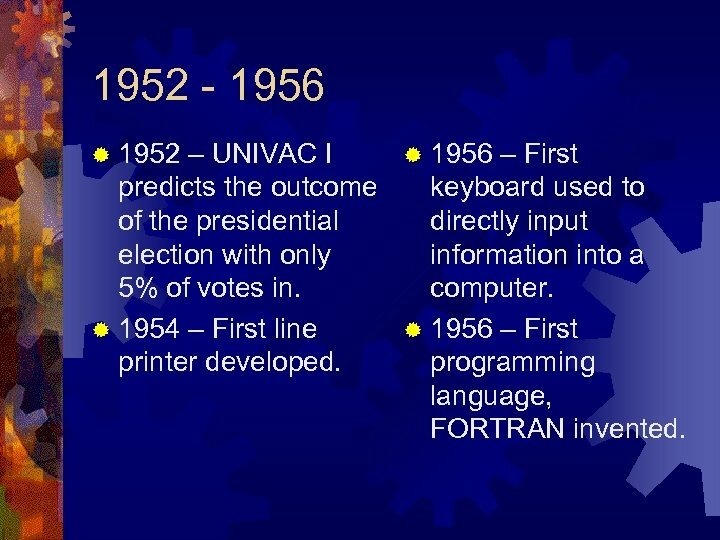 1952 - 1956 ® 1952 – UNIVAC I ® 1956 – First predicts the outcome keyboard used to of the presidential directly input election with only information into a 5% of votes in. computer. ® 1954 – First line ® 1956 – First printer developed. programming language, FORTRAN invented. 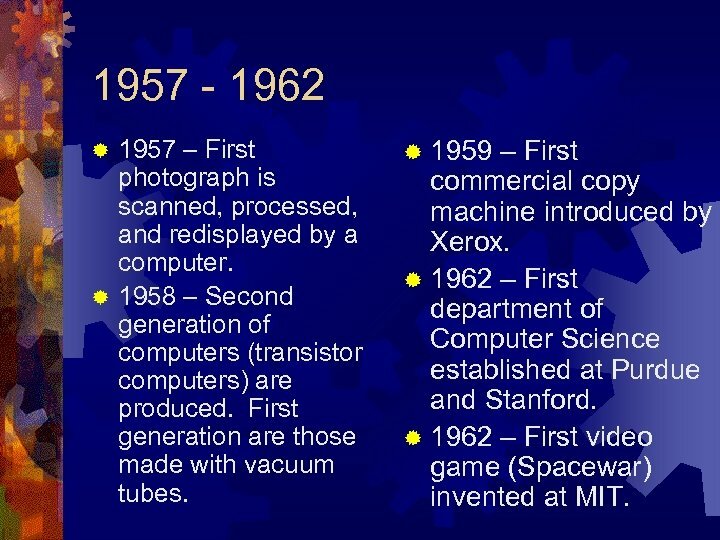 1957 - 1962 1957 – First photograph is scanned, processed, and redisplayed by a computer. ® 1958 – Second generation of computers (transistor computers) are produced. First generation are those made with vacuum tubes. ® ® 1959 – First commercial copy machine introduced by Xerox. 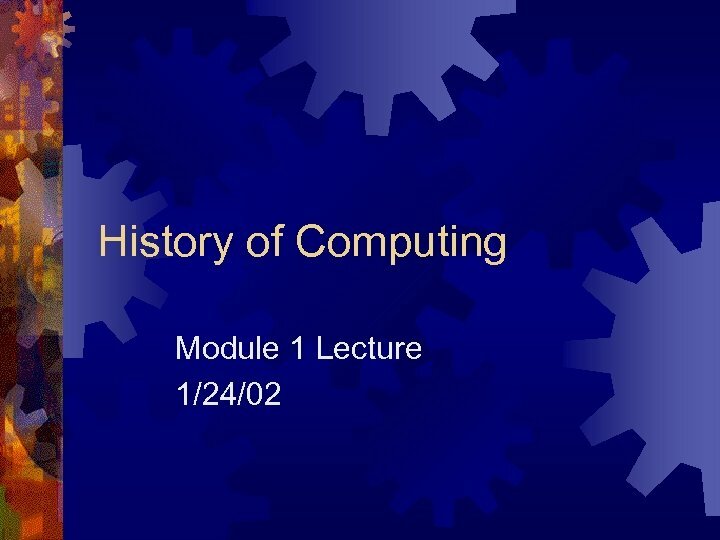 ® 1962 – First department of Computer Science established at Purdue and Stanford. ® 1962 – First video game (Spacewar) invented at MIT. 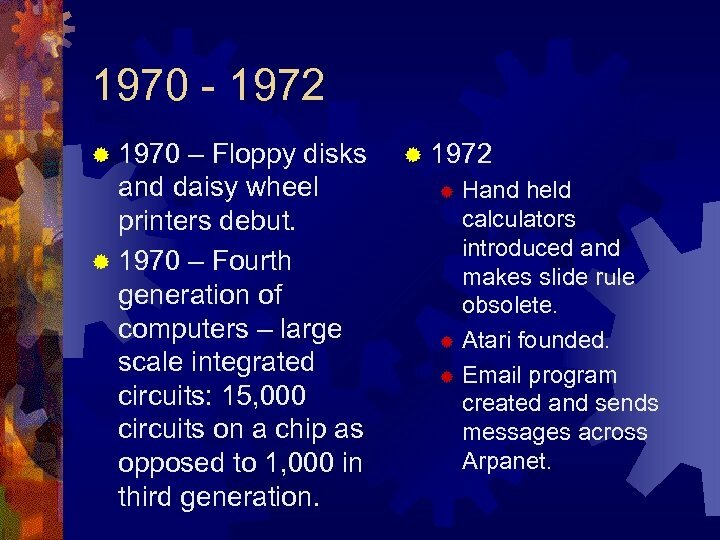 1973 - 1976 ® 1973 – Xerox PARC and Alan King develop a PC that uses icons, graphics, and a mouse. 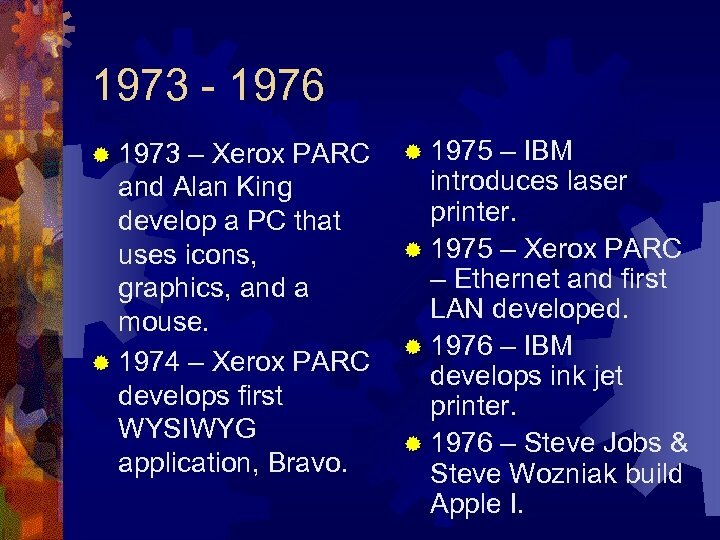 ® 1974 – Xerox PARC develops first WYSIWYG application, Bravo. ® 1975 – IBM introduces laser printer. 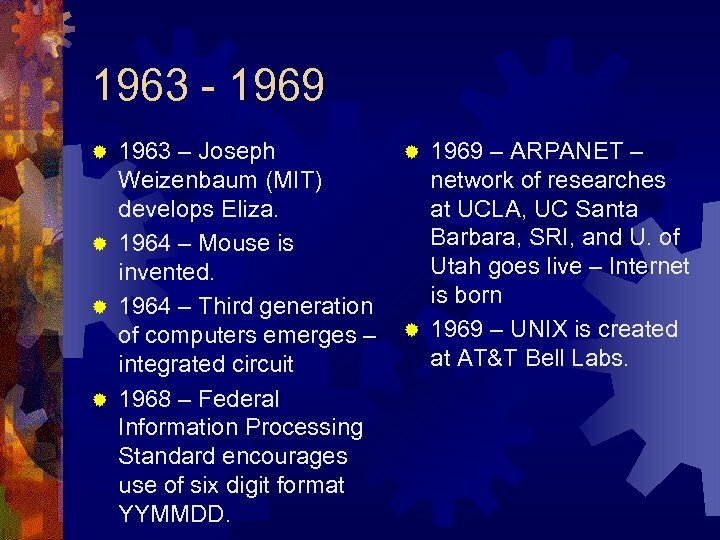 ® 1975 – Xerox PARC – Ethernet and first LAN developed. ® 1976 – IBM develops ink jet printer. ® 1976 – Steve Jobs & Steve Wozniak build Apple I. 1977 - 1980 ® 1977 – Apple II announced and produced with 16 K RAM, 16 K ROM, $1298. ® 1978 – First word processor, Wordstar. ® 1979 – First spreadsheet, Visi. 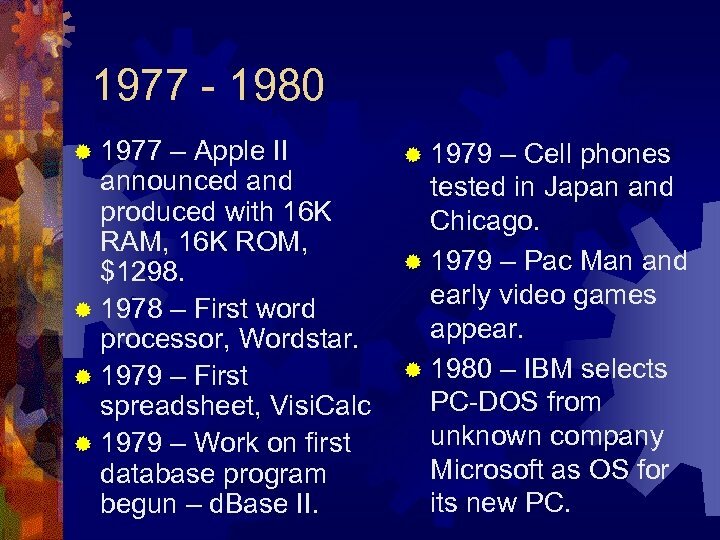 Calc ® 1979 – Work on first database program begun – d. Base II. ® 1979 – Cell phones tested in Japan and Chicago. ® 1979 – Pac Man and early video games appear. ® 1980 – IBM selects PC-DOS from unknown company Microsoft as OS for its new PC. 1981 - 1982 ® 1981 – First commercially successful portable computer, the Osborne I: 23 pounds, 64 K RAM. ® 1982 – Commodore 64: 64 K RAM, 20 K ROM, $595. ® 1982 – Sony announces CD technology. ® 1982 – Commercial email across 25 cities begins. 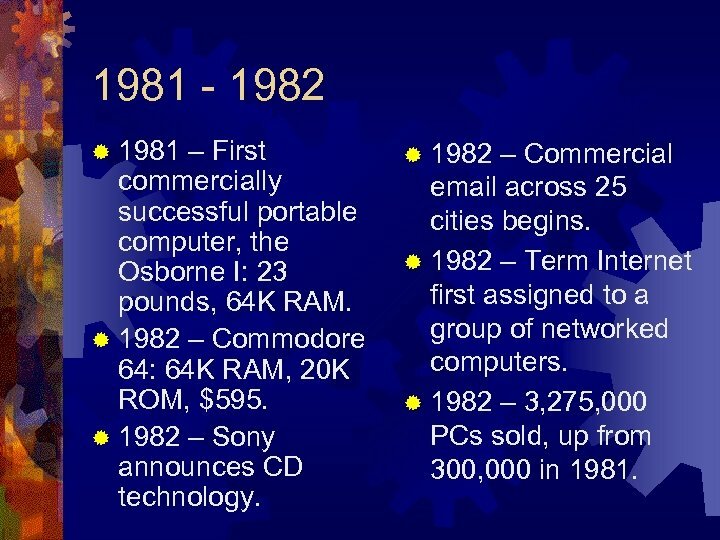 ® 1982 – Term Internet first assigned to a group of networked computers. ® 1982 – 3, 275, 000 PCs sold, up from 300, 000 in 1981. 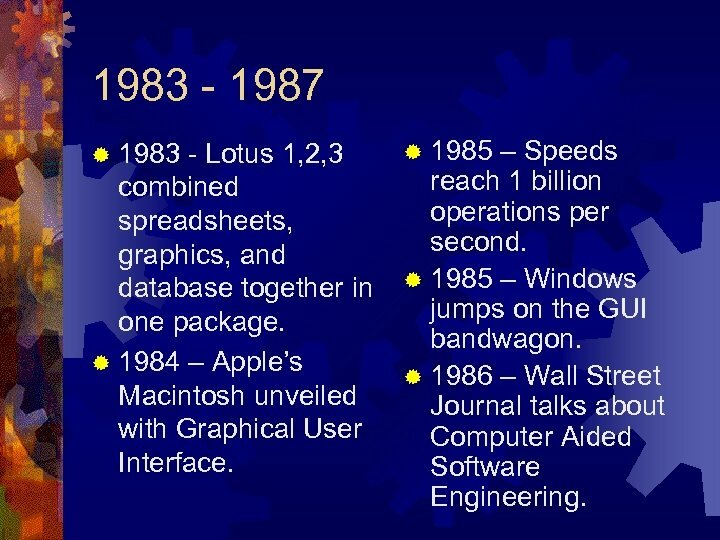 1983 - 1987 ® 1983 - Lotus 1, 2, 3 combined spreadsheets, graphics, and database together in one package. ® 1984 – Apple’s Macintosh unveiled with Graphical User Interface. 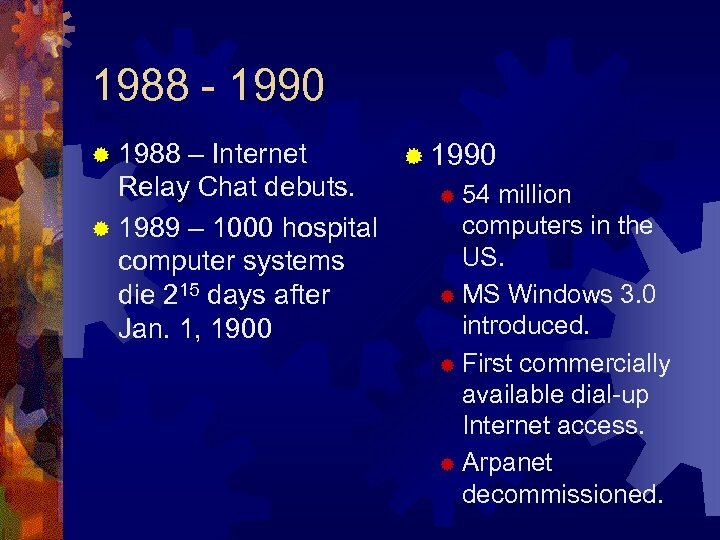 ® 1985 – Speeds reach 1 billion operations per second. ® 1985 – Windows jumps on the GUI bandwagon. ® 1986 – Wall Street Journal talks about Computer Aided Software Engineering. 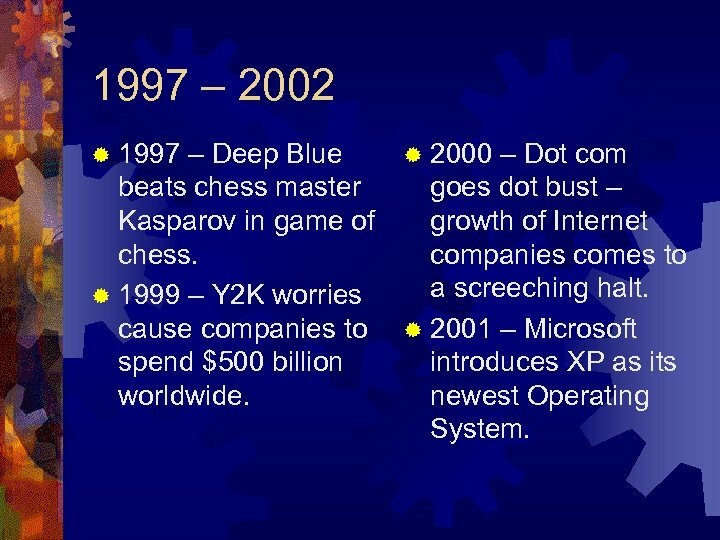 1997 – 2002 ® 1997 – Deep Blue beats chess master Kasparov in game of chess. ® 1999 – Y 2 K worries cause companies to spend $500 billion worldwide. 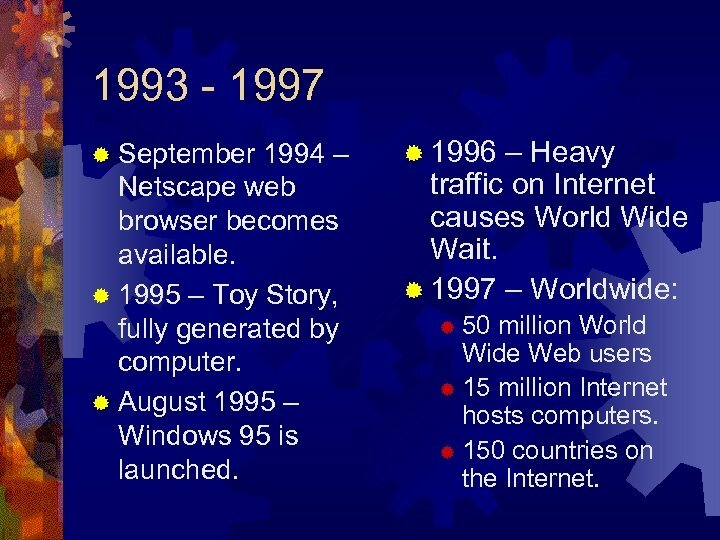 ® 2000 – Dot com goes dot bust – growth of Internet companies comes to a screeching halt. 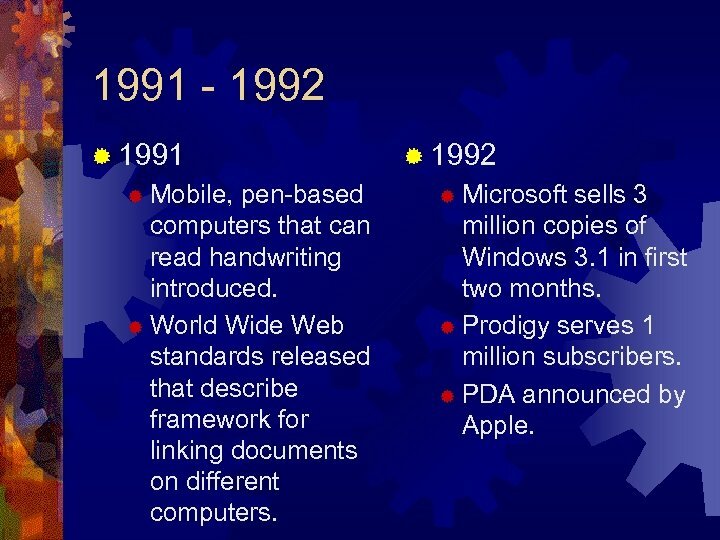 ® 2001 – Microsoft introduces XP as its newest Operating System.